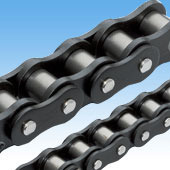 Top plates and Chains are made of engineering plastic and are connected using engineering plastic or stainless steel pins. Other types feature plates of engineering plastic combined with steel, nickel plated steel, lube free steel, or stainless steel base chains. Yet another type includes rollers attached to two strands of stainless steel or nickel plated chains. The rollers rotate freely and reduce line pressure during accumulation. Plastic top chains are used mainly in the food processing, beverage, dairy, and packaging industries. 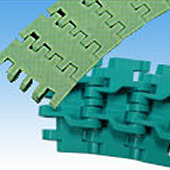 Plastic Top Chain is side-flexing conveyor chain with comb-toothed plates to minimize gaps between links. Ideal for conveying unstable containers such as PET bottles and dessert cups. (Minimum side-flex radius of 500 mm). 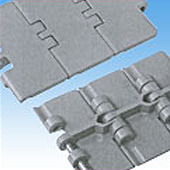 Plastic Top Chains are made of engineering plastic and are connected using engineering plastic or stainless steel pins. Other types feature plates of engineering plastic combined with steel, nickel-plated steel, lube-free steel, or stainless steel base chains. Yet another type includes rollers attached to two strands of stainless steel or nickel plated chains. The rollers rotate freely and reduce line pressure during accumulation. Plastic top chains are used mainly in the food processing, beverage, dairy, and packaging industries. Looking for Tsubaki Top Chains ?